During a quarter century in the House, Rep. Sylvester Turner gained influence as his party lost power by learning the rules and working with Republicans. As the chamber's Democratic pillar leaves to chase the Houston mayor's post one more time, many wonder who will step up in his place. 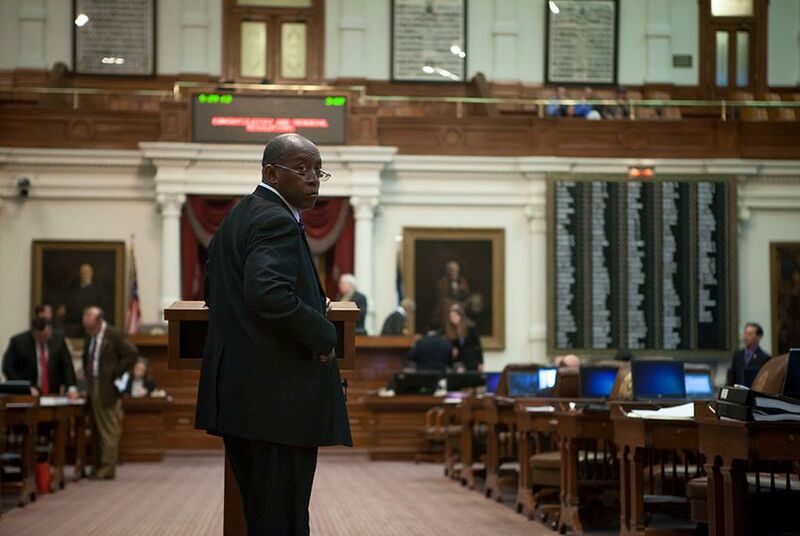 Turner had arrived in the Texas House 14 years earlier, when he and his fellow Democrats outnumbered Republicans 91 to 59, Gib Lewis was speaker and Democrats still ran the show. But by 2003, the tide hadn't just turned against Democrats — it was running away without them. Republicans took the chamber's majority for the first time in more than a century, Democrat Pete Laney, the previous session's speaker, was about to become just another member, and Tom Craddick was poised to take the top post. But as Turner prepares to leave the House after more than a quarter century, that decision captures the politician's essence — a savvy personability that allowed him to emerge as a Democratic pillar in the Republican-controlled House. The 60-year-old Harvard Law School graduate is running for mayor of his hometown, a post he's unsuccessfully sought before. His expected departure from the House will leave a gaping hole that House Democrats will be hard-pressed to fill. Well-respected and liked by members of both parties, Turner, now the sixth most senior House member, has managed to snap up positions on prominent committees and hold on to his place at important negotiating tables. He’s the vice chairman of the House Appropriations Committee, which drafts the chamber’s budget, and was the only Democrat to lead a budget subcommittee. He’s also a longtime member of the powerful State Affairs Committee, which takes up far-reaching measures on social issues, and spent several years on the Calendars Committee, which sets the daily calendar of bills to be considered by the lower chamber. Losing Turner’s ability to serve as a “bridge builder” within his party — and between Republicans and Democrats — will be felt the most, González added. At the podium, he’s studious, almost professorial asking questions as he peers at a bill's author over his thin-rimmed glasses. Oftentimes he takes those speeches to committee hearing rooms. During a state affairs hearing in April during which the committee considered an anti-gay marriage measure, Turner grilled a witness over his remarks about state sovereignty overruling decisions by the U.S. Supreme Court. Robert Eckels, a former Republican representative from Houston whose terms overlapped with Turner, said Turner’s institutional knowledge and disposition helped him fit in with conservatives. But for all the close ties Turner cultivated with Republican leadership, he also faced criticism from members of his own party. The Craddick D’s were considered traitors by some Democrats, and their votes in support of the speaker made them targets for primary challengers. Jim Dunnam, a former Democratic state representative from Waco who led the charge against Craddick, said it’s arguable that bipartisan relations in the House improved when various Democrats “were inside the Craddick tent,” but some Democrats clearly benefited from it. “Sylvester has always been a very astute politician, and I think an argument could be made that he was able to assist his district by maintaining those positions,” Dunnam said. Turner acknowledged that “group dynamics” are an important part of the House, despite tactical disagreements. “There will be times when we may differ on strategy and we may go different ways, but I think on balance when we have stayed together I think we’ve worked well,” he said. Some Democrats anticipate it’ll take a group effort to fill the hole Turner will leave. Others point to veteran House members like Senfronia Thompson and Garnet Coleman, both also Houston Democrats, among those who will continue carrying the mantle. Democratic state Rep. Armando Walle of Houston, who serves on appropriations with Turner, said it will be incumbent on other Democrats to step up — something made easier by Turner’s willingness to advise newer members. Vowing not to return to the House even if he loses the mayor’s race for a third time, Turner insists he’s not worried about “new champions” coming forward given House Democrats’ “young talent.” He points to the likes of González, Walle and Ana Hernandez, D-Houston. *Clarification: This story has been updated to reflect that the timeline for Rep. Sylvester Turner's departure from the House has not been set.